If you’re not able to “donate your face” to Movember this year but you know someone who is and you want to help them with some fundraising, there are lots of brilliant moustache related goodies out there. 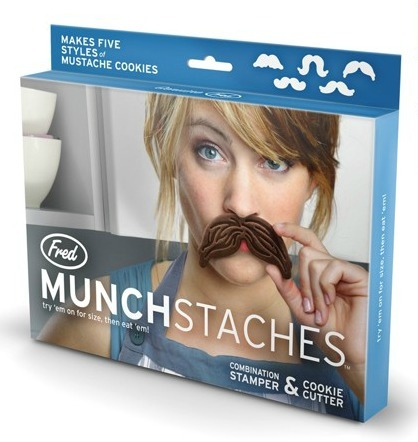 I spotted these in Oliver Bonas the other other day – Munchstache Cookie cutters from Fred & Friends. The cutter has an indented pattern on the top so you can flip it over and stamp some beautiful texture on to your Wolford, Baron, or Bristle Brush shaped mo amongst others. They look super fun, my only reservation might be whether the cut dough comes out easily from the cutter but the stamper means less decorating work to make them look fab. 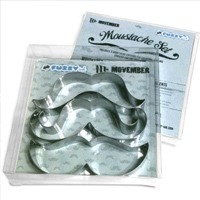 You could also try the Fuzzy Inc ones which are available via the Movember website – looks like they ship from the US. 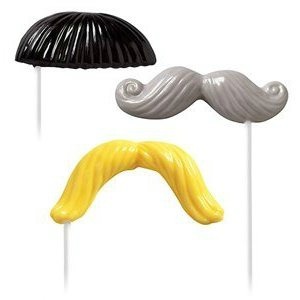 Wilton make these rather fab Mustache Molds (note the US spelling if you’re looking for them online!) which could be used with chocolate as well as their candy melts. 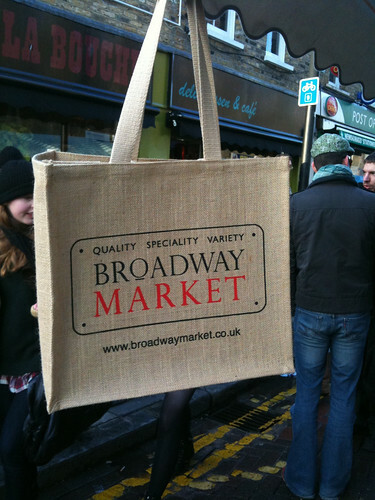 Not so widely available here with paying a hefty shipping charge, but could be used again and again. In the UK, all the ‘Mo Bros’ who participate in Movember help to stimulate conversation about men’s health and raise awareness of the most prevalent male cancers, testicular and prostate. I had an idea to make some biscuits to welcome in the Year of the Rabbit – well, mostly I just wanted to make biscuits. Bake something. Partially because I find baking particularly conducive to ‘thinking time’ where my mind wanders off and it’s a great stress-busting exercise as well as being productive. Not forgetting the fact I also have a ridiculously sweet tooth. However, baking generally tends to be easier, and less stressful, when you haven’t forgotten to buy eggs. 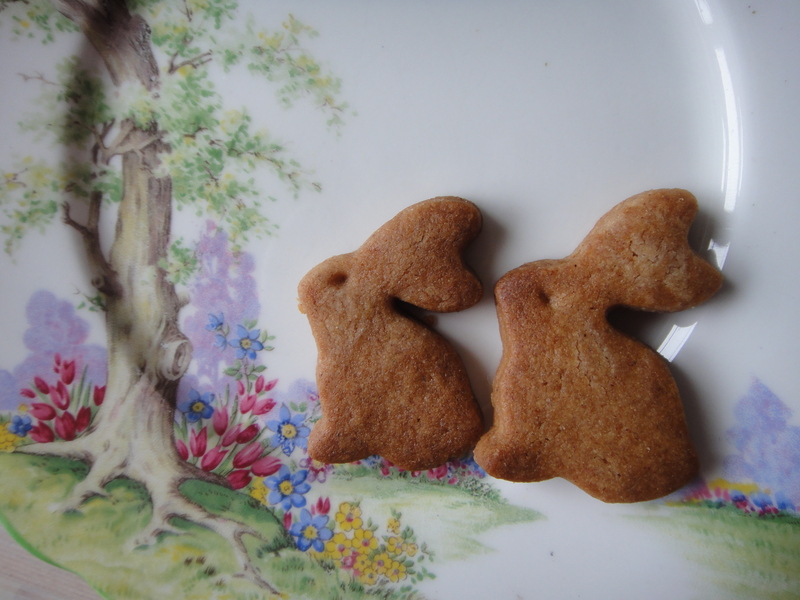 The Biscuiteers book came to the rescue with an eggless recipe for Treacle Spice Cookies which I tinkered with to make these golden bunnies. I was so excited when I bought this book – not for the gloriously embellished slices of sugar themselves, more for the comprehensive range of base biscuit recipes (10 in total) because many doughs simply don’t hold up to rolling and cutting. The book itself is more of an artist’s primer in some ways with lots of technique and decoration ideas, and you’ll have to like sugar. 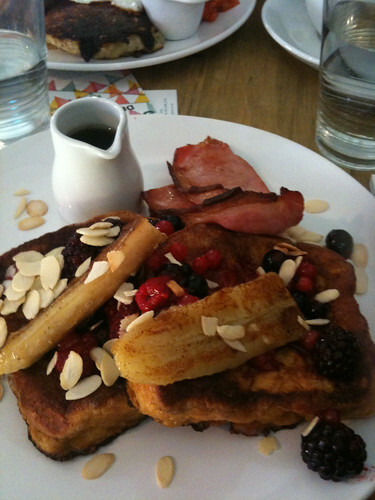 Or pretty food. 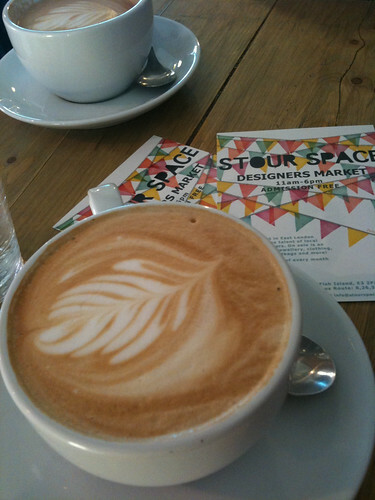 But as usual with Kyle Cathie, it’s beautifully photographed and designed. It probably wouldn’t be the most used cook book on your shelf but hey, just take it down occasionally and look at the pictures. Sift flour, baking powder and spices together and then mix in the sugars. 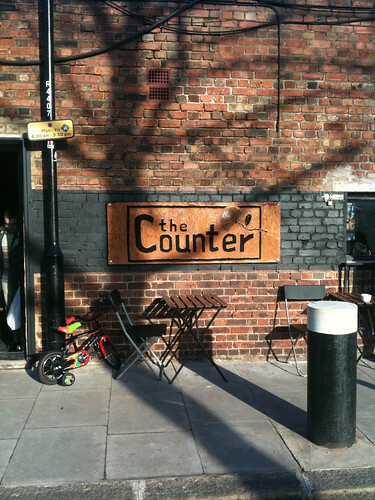 Rub the butter in with your fingers as if you were making scone, until it’s like breadcrumbs. 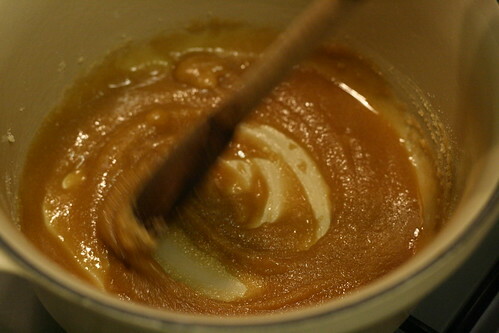 Make a well in the centre of the incorporated mixture and add in the Golden Syrup and combine to an evenly-coloured dough. Divide into two pieces, shape as discs and chill for at least 30 minutes. 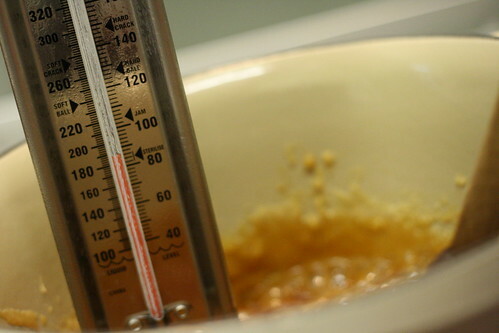 Preheat the oven to 170c/350F/Gas Mark 4 when the dough is chilling, then cook for 14-18 minutes. These keep remarkably well. 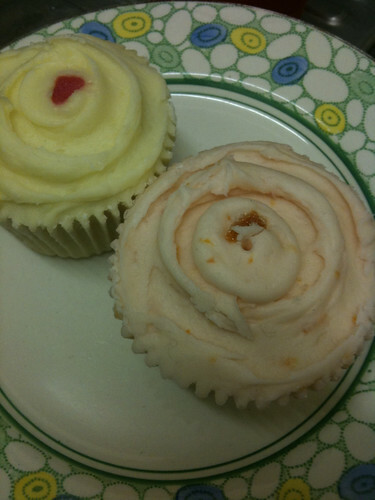 I was going to make a lemon cream filling – but none of them survived long enough to be sandwiched. 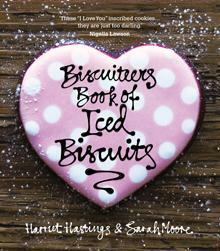 The Biscuiteers Book of Iced Biscuits by Harriet Hastings and Sarah Moore is published by Kyle Cathie, ISBN 978 1 85626 941 4. 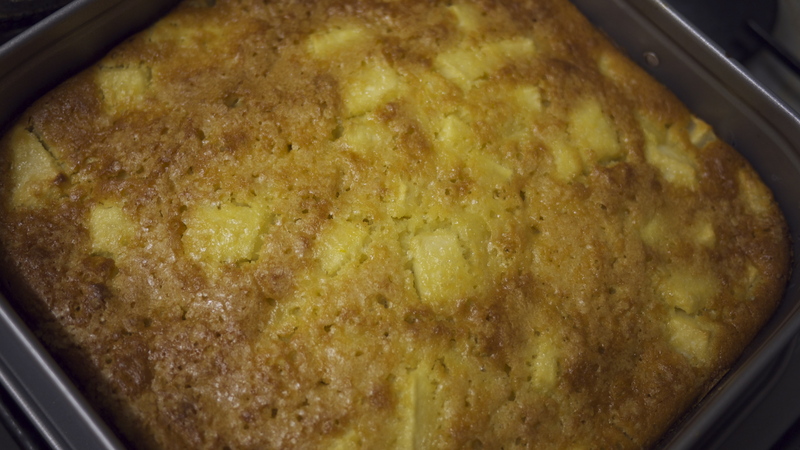 I’ve never made an apple cake before but it’s autumnlike and blustery and it seemed like a good time. I threw pears into the shopping basket too and when at home, wondered if they wouldn’t work well together, with the right augmentation. According to Niki Segnit, author of the Flavour Thesaurus, apple can contain surprising elements such as nutmeg and anise, as well as nutty notes near the core which can be reminiscent of almond. 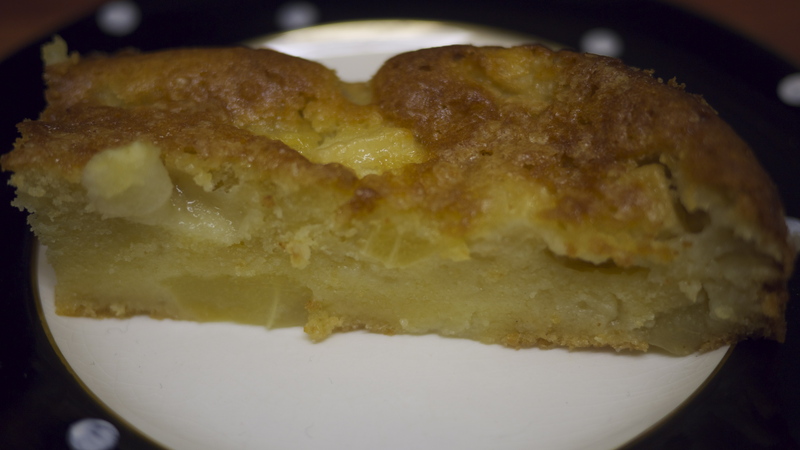 She flags apple and pear as a very well established pairing, and quince is another pome fruit. That she credits with apple, pear, rose and honey tastes. Hence the roundabout inspiration for this cake. It’s an adaptation of a recipe by Allegra McEvedy which was in the Guardian, which I went for mainly because of the quick prep and cooking time. 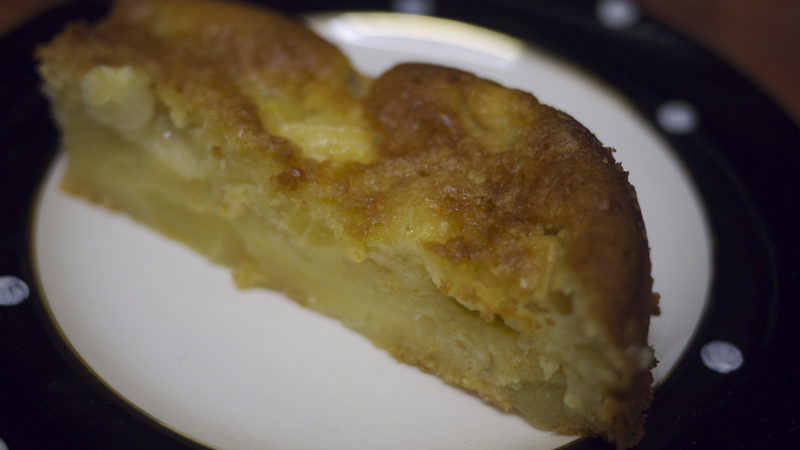 It turned out to almost more like a clafoutis than a cake but I thought calling it that would just confuse matters. Not that I encourage this sort of thing, but I imagine it would work well with a dollop of cream and a grating of nutmeg. Or some thin, rich, eggy homemade custard. Preheat the oven to Gas Mark 4, 175C. I used a 25cm square tin, and spray oil to grease it. You may want to tone down the rose but it seemed to go down well with the Baked Goods Tester Panel so I’ve left the quantities as I made it. I have a problem with bananas. 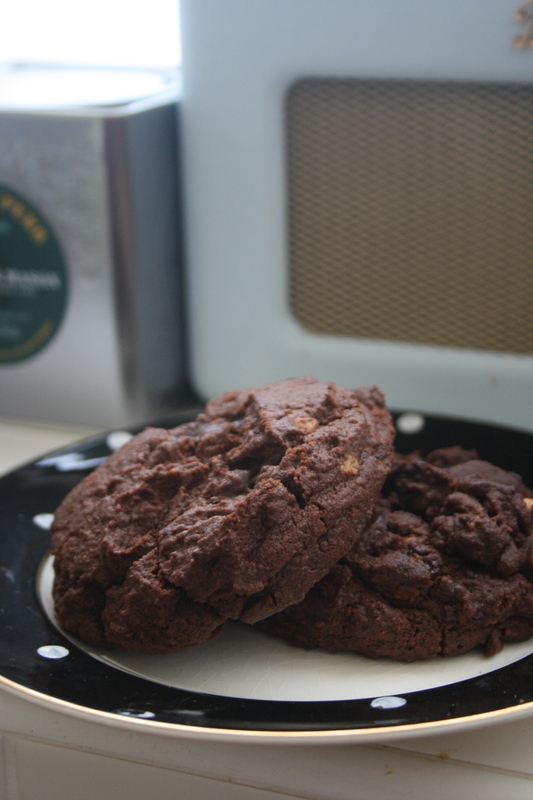 The problem is that I buy them, forget about them and then I’m compelled to bake with them. Yeah, I know, the epitome of firstworldproblems. 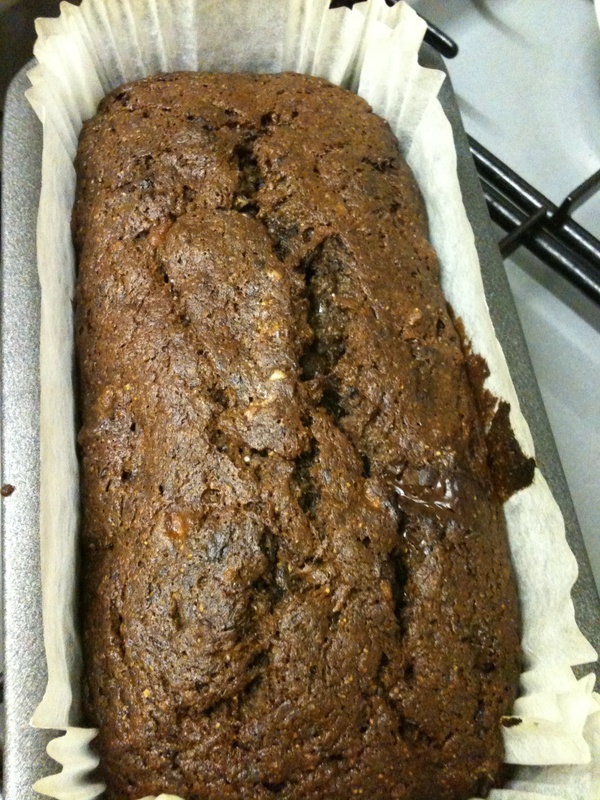 This started off as a banana loaf cake idea and then the Green & Black’s cocoa fell out of the cupboard (I really should tidy up more) and it seemed worth trying. 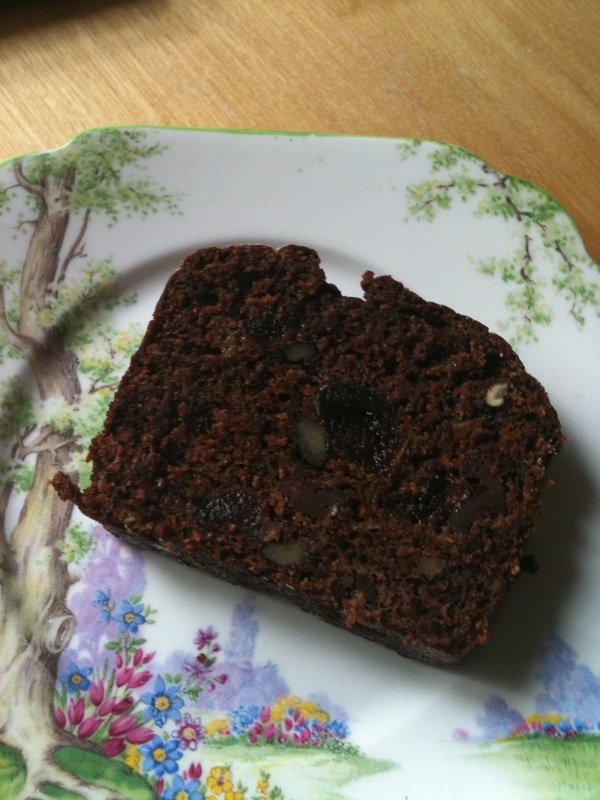 Then it turned into pantry cake when I started pulling more things out of the press, including cherries and walnuts. The cherries melt a little like dates and led to the tasters asking if there was booze in there. 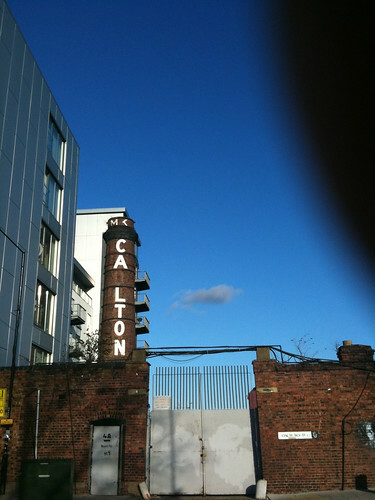 Not this time…. Makes a 1lb loaf. Preheat oven to Gas Mark 4, 180c. Improves over a day or two too. I had egg whites in the fridge and couldn’t think of anything to make that wasn’t meringue-based. Ok, not strictly true. I’ve been obsessed with macarons for a while. 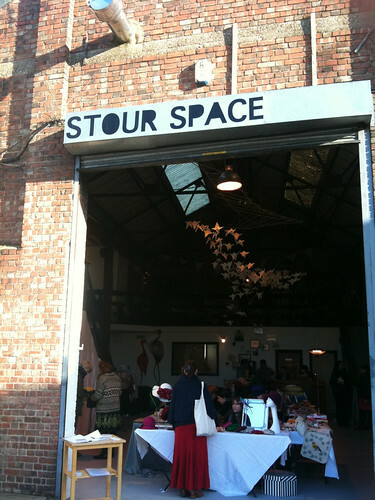 Yes, I am using the poncy French spelling. That’s because I am particularly obsessed with the French, perfumed, pastel morsels served up by the likes of Pierre Herme and Laduree. Though the first ones I ever made were pistachio, to a Nigella recipe, to ensure that I had something suitable for a coeliac friend who was coming to afternoon tea. That’s the basic recipe that I used to start off this version. Grind the macadamias and icing sugar in a food processor. 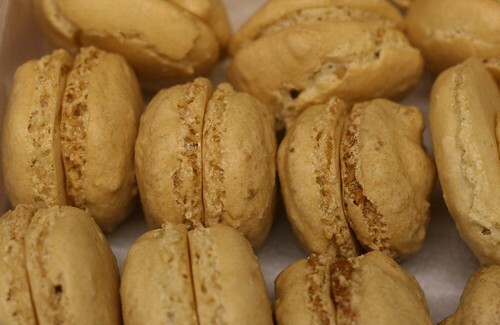 Probably more finely that I did, as it led to a barely but visibly bumpy surface to the cooked macarons. Add the orange essence to the eggs, then whisk the two egg whites til stiff but not dry. 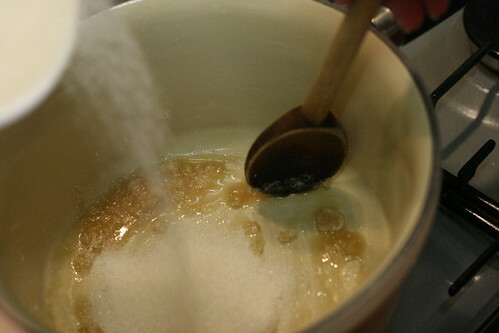 Add the caster sugar. Whisk til stiff. 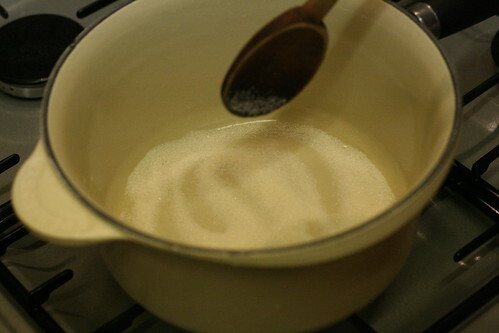 Fold the whites into the macadamia sugar, gently. Pipe on to a parchment baking sheet. Allow to sit so they form a skin. Cook for 10-12 minutes, then cool on the sheets. I put two trays in the (non-fan, bane of my life) oven and the bottom ones cracked slightly, so will know not to do that again. 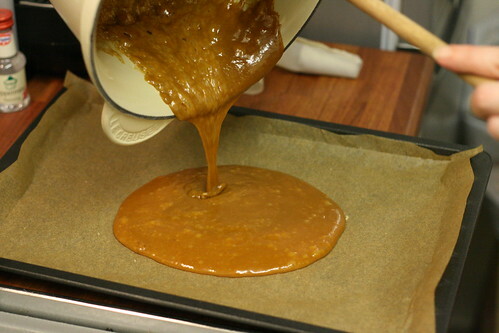 For the filling, I knew I wanted to do some sort of caramel. 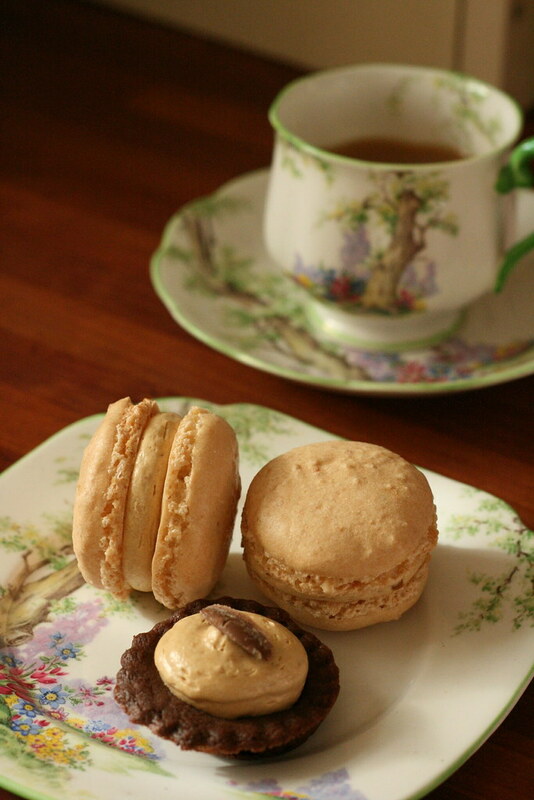 I spent some time drooling over researching macarons (like Edward’s amazing ones, with lots of tips too) and went with Diane’s step-by-step, including mise-en-place tutorial. I still feel a little limited because I don’t have a stand mixer, and waited for the boyfriend to come home to help. Supervise. Take me to the A&E with burns. In fact it’s simple, and safe as long as you follow the instructions. 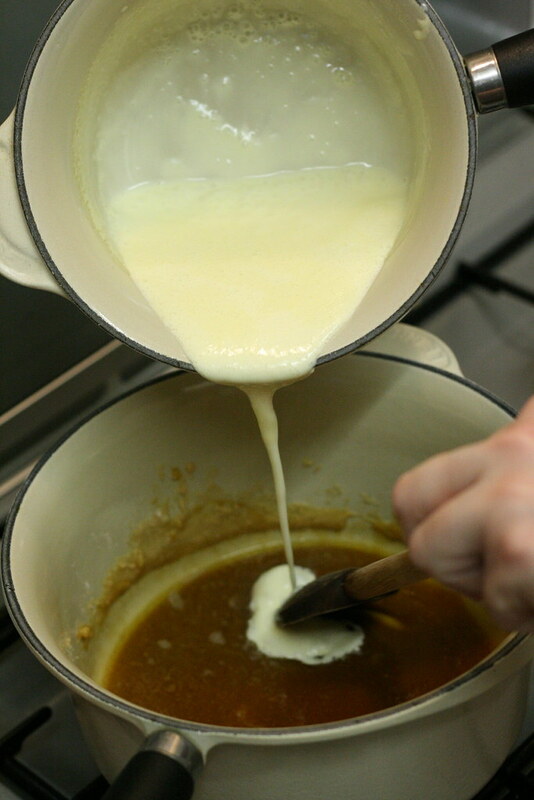 I did wonder if it was going to work, beating the cooled caramel in with cream cheese and butter. It did. I piped this glorious splodgy cream onto the paired up macarons and found that I had half a piping bag left over. 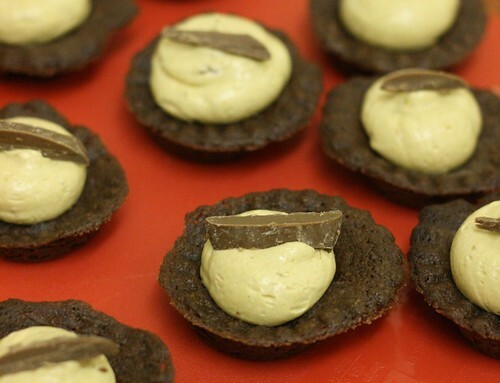 So I filled some experimental chocolate tartlet shells (experiment is a nice way of saying I screwed them up) with the remaining mixture, and popped a sliver of chopped Montezuma milk chocolate button on top. I dropped some of these off yesterday to various people in town – because if we eat all of them, frankly we’ll turn into Teletubbies. Would you like some?